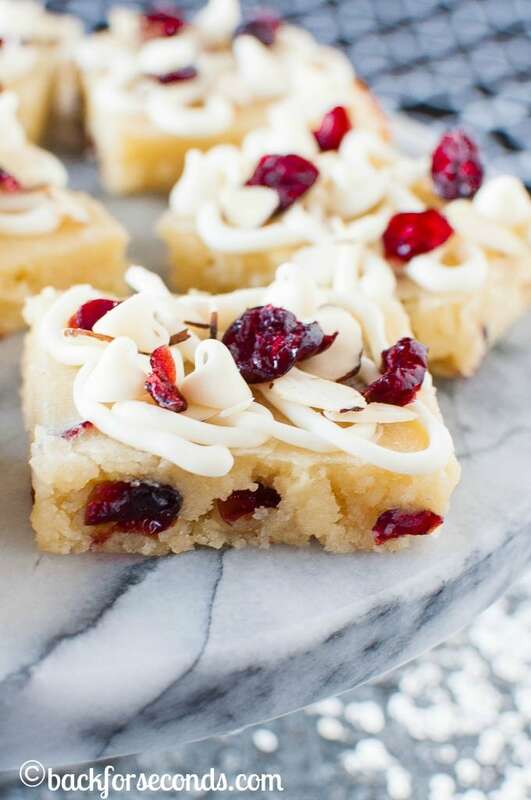 Cranberry Almond White Chocolate Brownies are chewy and fudgy and completely irresistible! This is a festive, easy dessert recipe perfect for the holidays! I don’t know about you, but I am already in holiday mode. Thanksgiving and Christmas are on my mind and cozy, festive recipes are all I want to make! 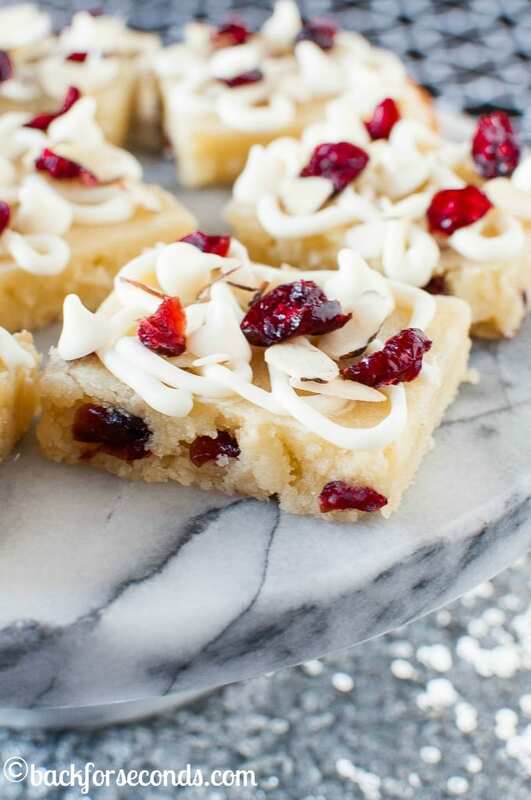 These Cranberry Almond White Chocolate Brownies are wonderful because they are simple to make, yet festive enough for the holidays – or any day! I learned a little baking secret a few years ago, want to hear it? Almost any plain recipe – white cake, yellow cake, vanilla frosting, white chocolate brownies, etc. can be make a million times better with just a tiny splash of almond extract. I almost always add it to more simply flavored baked goods, and everyone always comments on how GOOD they are! You have to be careful not to add too much though, or it will not be very tasty anymore. Just 1/4 tsp is usually enough to do the trick! 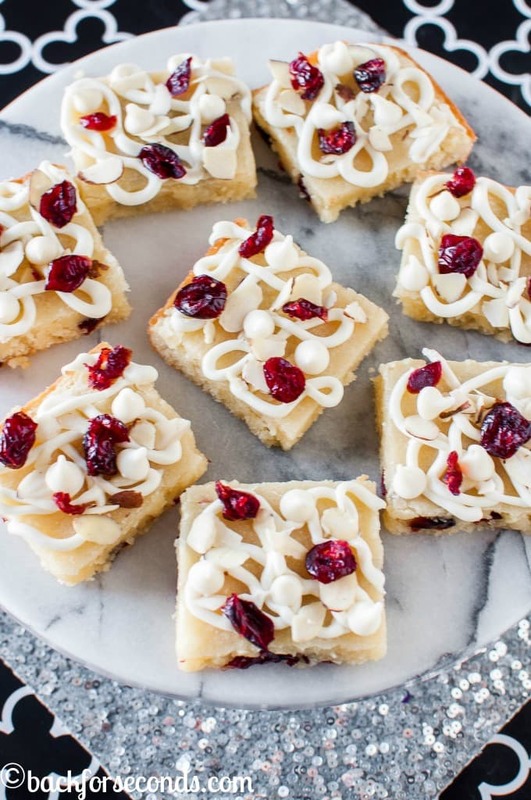 I have a fabulous recipe for White Chocolate Brownies in my cookbook Brownies, Blondies, and Bars, and this is a spin off of those. 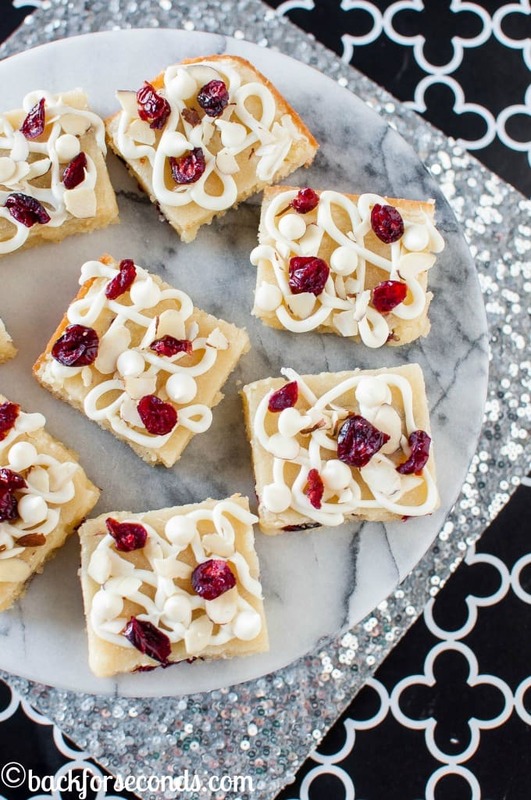 If white chocolate, almonds, and cranberries are your jam, you need these in your life! Of course you could leave out cranberries if you don’t like them. Or swap the almonds out for another nut. These are easy to customize according to your tastes. I love how pretty these are too. The red berries and white chocolare look nice and festive without being so overly holiday themed that you can’t serve them any time of year. Mmmm I love white chocolate + cranberries together! Yum! Cannot believe Christmas is so close! Love this recipe! Such a great dessert for the holidays!! !